I'll be developing a feature on this page in the future. For the time being, here's what Sir Cliff had to say at the unveiling of a plaque on the site of the 2Is coffee bar on 18 September 06. Sound file courtesy of Vince Eager. The Daily Mail reported: Stars from the earliest days of British rock 'n' roll gathered at the spot widely regarded as its birthplace. 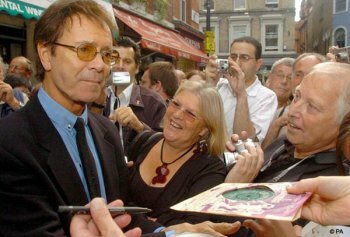 Singers and musicians, including Sir Cliff Richard, were present at the unveiling of a commemorative plaque at the 2 i's Coffee Bar in Old Compton Street, in London's Soho. The venue opened in 1956 and audiences crammed into the tiny basement to see acts such as Sir Cliff, Tommy Steele, The Shadows and Adam Faith. Sir Cliff told other performers and fans outside the venue, now the Boulevard Bar and Dining Room: "I wish this restaurant well and I hope people who come and eat here will have a ghostly vibe about what used to go on down below." The venue had been the nucleus of rock 'n' roll in Britain, he said. "There were so many of us that loved rock 'n' roll and wanted to do it and some of us got lucky. "When I look at the old photographs, I wonder how I ever got started - I was a greasy slob who couldn't sing. "It's a great idea to have a plaque here because it's too easy to forget how we got where we are now." Councillor Robert Davis, cabinet member for planning on Westminster City Council, which put up the green plaque, said: "In the early days of rock 'n' roll in this country, before The Beatles had even formed, pretty much every act that made it big cut their teeth at the 2 i's. "It is only fitting that, half a century since it opened its doors, it is commemorated with a plaque so that the thousands of people who walk along Old Compton Street every day know they are passing the place where British rock 'n' roll was born." Performers present included Bruce Welch of The Shadows, who said: "It was an exciting time. It was a hotchpotch of wannabes." And Clem Cattini, drummer with The Tornados, whose Telstar was a smash hit, said: "You'd never get away with it now, with today's health and safety rules. But it was incredible, fantastic."